The outdoors have never been so homey! 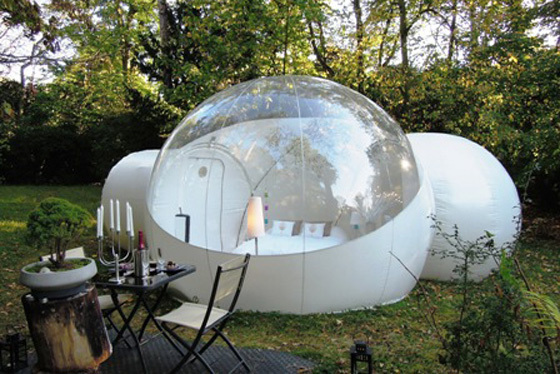 The Les Bivouacs de la Reine, also known as the Casa Bubble house, are stylish accommodations that offer a cozy atmosphere in the outdoors. The Bubbles are not meant to be permanent structures and are most often used for temporary exhibitions, temporary eco-tourism structures, and special event occasions. The Bubbles, which are sometimes clear and sometimes slightly opaque, are made from a recycled / recyclable PVC material and leaves little impact to the environment. Stretching 13 feet in diameter, this self-enclosed inflatable has no framework. The sphere maintains its shape by having air constantly pumped into it. This leaves the environment clean and allergy-free, with no humidity or condensation. 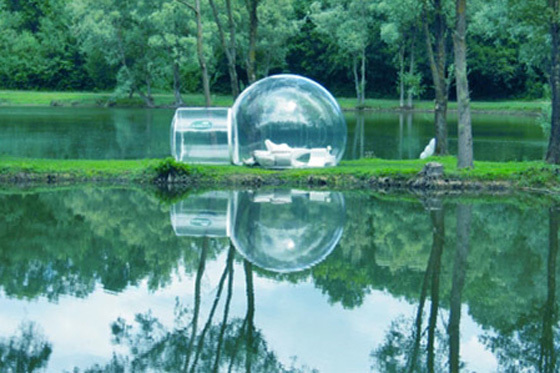 In just 15 minutes, the Bubble can inflate, turning into a temporary living space. This environmentally friendly architecture adds glam to temporary outdoor living. It is a great example of pop-up architecture and eco design becoming one.